As I walked into the house this afternoon, I quickly noticed black ants crawling on the wall in the laundry room. Closer inspection revealed that they were streaming out from a crack underneath one of the cabinets. Odd, I thought, they shouldn’t be there. Last week, I had had an exterminator come out and hose the house down in glorious chemicals. The exterminator also strategically placed “ant bait” (clear goop that ants apparently love) around just in case any of the tiny invaders decided to return. Today they launched their D-Day, their day of death. Springing into action, I immediately grabbed some of the gooey ant bait and placed it directly in their path. They flocked to it! Soon, the small dab of clear goop was covered in ants. Little did they know that their demise, and the demise of their queen, was but a meal away. 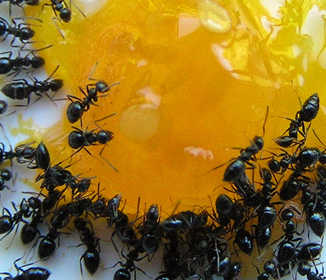 All it will take is one ant, carrying the goop back to the queen, to destroy the entire colony. Biological warfare on the insect scale. For some reason, this scenario of unknowing death got me thinking about bigger life issues. What things am I consuming that could be unknowingly poisoning me? A question I am certainly going to have to spend some time thinking about. What about you?